This unique and picturesque park consists of lakes, wetlands, marine and terrestrial environments. 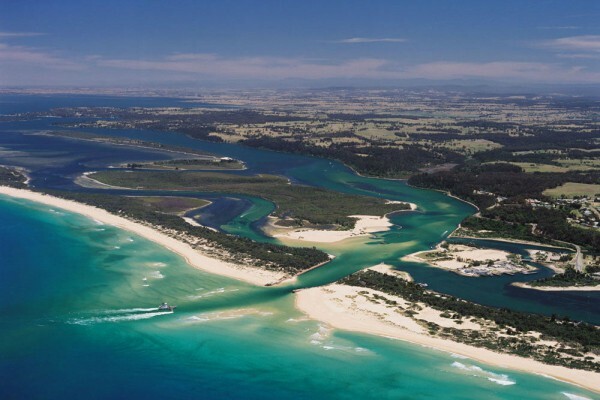 The Gippsland Lakes Coastal Park is a narrow coastal reserve covering 17,584 hectares along a portion of the Ninety Mile Beach, from Seaspray to Lakes Entrance. The park also includes the internationally significant Lake Reeve, several islands and the Boole Poole Peninsula. Designated camping sites are situated between Paradise Beach and The Honeysuckles along Shoreline Drive at Golden Beach. Boat based bush camping sites are available at Bunga Arm east of Steamer Landing. A few bush camping sites are also situated west of Loch Sport. Basic facilities are provided at some of these sites. It is recommended that water be carried. There are many picnic areas in natural surroundings throughout the park. There are swimming sites along the sheltered lake shores. Take great care when swimming along the Ninety Mile Beach. It is recommended that swimming be contained within flagged areas patrolled by surf life saving clubs. Surf fishing along the Ninety Mile Beach or lake fishing from a boat, bank or jetty is popular throughout the park. Bream, Flathead, Skip Jack, Luderick and Mullet are the main fish caught. Please note that a recreational fishing licence is required for all coastal and inland waters. The Lakes provide excellent opportunities for boating and water skiing in designated areas. Boat ramps are situated at Seacombe, Wattle Point, Paynesville, Metung, Nungurner, Loch Sport and Lakes Entrance. Jetties for access to the park are provided at Barrier Landing, Drews Jetty, Ocean Grange, Silver Shot Landing and Steamer Landing. Boat operators are encouraged to use the sewage pump out or hopper facilities situated around the lakes for the disposal of sewage. Horse riding is permitted along formed tracks within the park, west of Loch Sport. Horse riding is not permitted on the Ninety Mile Beach. Management tracks, which are normally closed to private vehicles, provide ready access for walkers to explore some of the more secluded areas of the park. The Ninety Mile Beach is also excellent for walking. Licensed hunting and firearms are permitted in designated areas of the Gippsland Lakes Coastal Park. Wild duck, Stubble Quail and Hog Deer may be hunted in season only. All hunting must be done in accordance with the regulations as set out under the Wildlife, National Parks and Firearms Acts. Hunting is not permitted on private property without permission. Toilets, water, picnic tables and fireplaces are provided at major sites. Drinking water and firewood are not readily available and visitors should carry their own supply, or alternatively bring a gas barbecue. Fires are only permitted in the fireplaces provided. The Gippsland Lakes fall within the boundaries of the area occupied by the Tatungalung clan of the Gunai/Kurnai people. Evidence of their occupation occurs in numerous midden sites containing shellfish remains, charcoal and burnt pebbles. The first European records of the Gippsland Lakes were by Angus McMillan in 1840 and of the seaward entrance to the lakes by John Reeve in 1842. The wreck of a ship, the Trinculo which was beached in 1858, is still evident today west of Delray Beach. Historic sites in the park include the "Honeymoon Cottage" on Boole Poole Peninsula and the blow hole sites on the outer barrier adjacent to Bunga Arm. The site of construction of the artificial entrance to the sea at Lakes Entrance and eel farming ponds near McLennan Strait are still evident today. Remains of more recent activity include survey lines and sealed bores left from petroleum exploration. The Ninety Mile Beach is a good place to observe shore and ocean birds such as shearwaters, terns and gulls. Parts of the Gippsland Lakes system, including Lake Reeve, are listed under the Ramsar Convention on Wetlands of International Importance, especially as waterfowl habitat. The lakes attract the largest concentration of migratory waders in East Gippsland and are host to breeding colonies of the vulnerable Fairy Terns and Little Terns. You may also observe Common Greenshank, Marsh Sandpiper and Bar-tailed Godwit to name a few. Within the heathy woodland areas of the park you will see many species of bird including the Common Bronze Wing, Yellow-tailed Black Cockatoo, Grey Butcherbird, Eastern Yellow Robin and the gracious Wedge-tailed Eagle. The park supports a large population of Eastern Grey Kangaroos, Black Wallabies and the common Brush-tailed and Ring-tailed Possums. Less common mammals include Sugar Gliders, Eastern Pygmy Possums and the endangered New Holland Mouse. The plants growing in the park can be divided into three main types: coastal, swamp and heathy woodland. These grow mostly on leached sand of low fertility. Coastal vegetation growing along the seaward side of the dunes is adapted to grow in harsh conditions of wind, salt, sun, shifting sand, little water and few nutrients. These plants include Hairy Spinifex, Marram Grass, Cushion Bush, Coast Saltbush, Sea Rocket and Coastal Everlasting. Behind the dunes conditions are less severe allowing Coastal Tea-tree thickets and Coast Banksia woodlands to grow. Swamp vegetation grows around the lakes and includes rushes, sedges and Swamp Paperbark. Heath vegetation is also adapted to grow in poor soils. Major species include Shining Peppermint, Yertchuk, Coastal Tea-tree and Saw Banksia. The more common understorey plants consist of Bracken, Silky Tea-tree, Sweet Wattle and Common Heath. The diverse range of habitats within the park enable plenty of opportunities for viewing a wide range of wildlife. Campers are required to maintain a clean and tidy camp site at all times. Between December and Easter, bins are provided for campers' refuse at the Paradise Beach Camping Ground and west of Golden Beach. Outside of this peak period and in areas where bins are not provided, campers are required to take their rubbish away. In the Gippsland Lakes Costal Park, dogs are only permitted (on a leash at all times) at the following locations: Barrier Landing, Ocean Grange, Paradise Beach, Loch Sport Causeway, The Wreck, Flamingo Beach, The Honeysuckles and between camp sites one to six on Shoreline Drive at Golden Beach. Dogs are not permitted in other areas of the park nor between camp sites seven to twenty along Shoreline Drive, Golden Beach. Owners are also required to clean up their dog's litter. Dogs used for the flushing or retrieval of game birds are permitted in the hunting zones of the park, during and 24 hours prior to, the commencement of the open season. Fires are not permitted on the Ninety Mile Beach and are not permitted anywhere on days of Total Fire Ban. Camp fires may only be lit in fireplaces provided or in a 30cm deep pit in designated camping areas. They are to be clear of all flammable material within a radius of three metres. Fires are to be no larger than one square metre in size and must not be left unattended. Camp fires must be completely extinguished with water before leaving. Vehicles must stay on formed tracks and are not permitted "off road" including the Ninety Mile Beach. Firearms are not permitted (except in hunting areas in season). The Gippsland Lakes Coastal Park is in East Gippsland. The western section of the park is accessible by road via Seaspray and Golden Beach. The eastern section of the park is accessible only by boat.